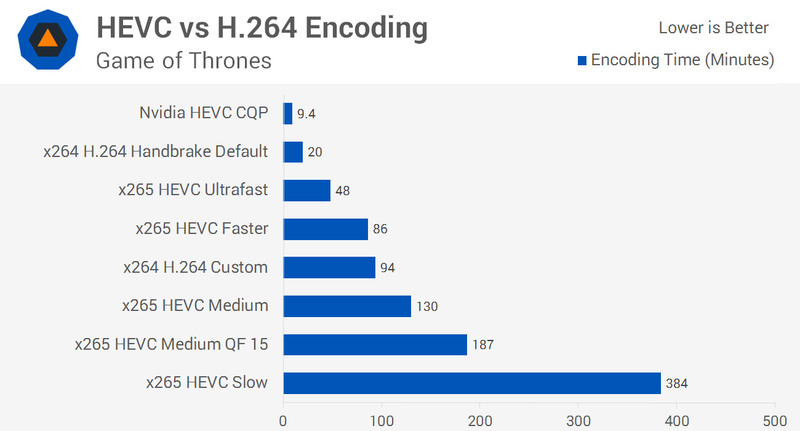 H.265, x265 and HVEC are names for a modern video encoding method, predecessor to the common H.264 (x264). x265 will give better quality for less file size, the downside being that it will use a lot more CPU to encode and only certain modern computers can view a x265 video. As technology advanced bigger video resolutions like 4k (and 8k) are entering the consumer market. Netflix, Blu-ray, sports and TV shows taking advantage of Ultra high-definition video. That is where x265 is meant to save the day and deliver high quality content in a smaller file size. The only real halt to x265 becoming the norm is the device incompatibility. Mobiles and tablets being the Achilles heal to the seemingly better encoding method. From a live stream to downloaded content you will be lucky if you can watch x265 video on your phone. Whilst it’s not “half the size” of x264 smaller video files certainly are achievable. This extremetech diagram shows big file compression for x265 over the old x264. As for encoding speed, thanks to techspot.com x265 is can be very slow. No surprises though, x265 is made for compression with quality not a quick encode. The jump in time taken from Ultrafast to Faster is a notable increase. You can also see a default x264 beat the x265 Ultrafast comfortably. How long for x265 to bloom? Soon. Seriously soon. Given the iPhone has been able to play HVEC from way back to 2016 (IOS 11) as these older mobile devices get phased out in favour of newer devices capable of x265 media and content will follow. YouTube as of now is x264 only, but to open up a new can of worms YouTube, Amazon and Netflix are working on AV1 which is said to match x265. For further reading and comparisons on x265 vs x264 have a look at this excellent blog post.